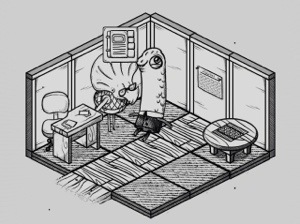 I’m going to try to write this review without giving much away, as part of the charm of Oquonie is going in without knowing much. There is absolutely no hand-holding in this game, and a large part of the fun is messing around and discovering how things work through trial and error. 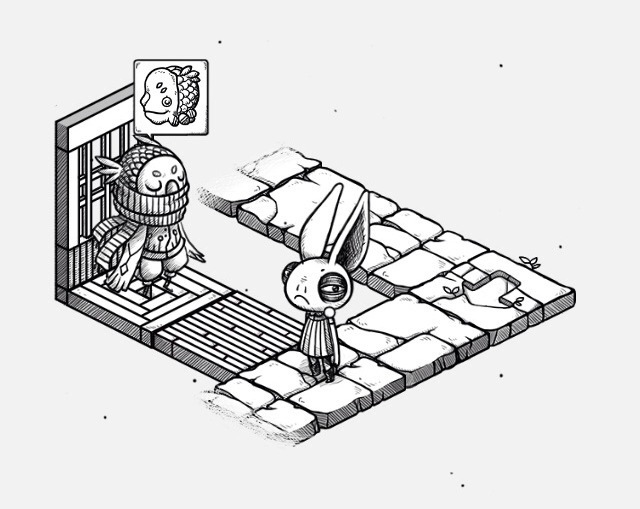 If you come across the any photos from Oquonie (like the ones above), you’re likely to be intrigued by the graphics, which are gorgeously surreal and reminiscent of Edward Gorey drawings. But you might not be sure whether to buy, wondering whether the gameplay matches the artwork. Even this YouTube video doesn’t do the game much justice, as watching someone else play is about as much fun as a root canal. Simply put, you need to experience this game first-hand. It is such a unique and immersive experience, that no video can capture it well. You’re thrown into the game with zero guidance. There are no words. Everything is visual, and you need to figure it all out on your own (or ask for help outside the game). This makes solving puzzles especially rewarding, but can be frustrating for those who don’t enjoy exploring their surroundings simply to make sense of anything. The controls are simple and responsive. You start off as a long-necked creature that I’ve decided to call a llama. 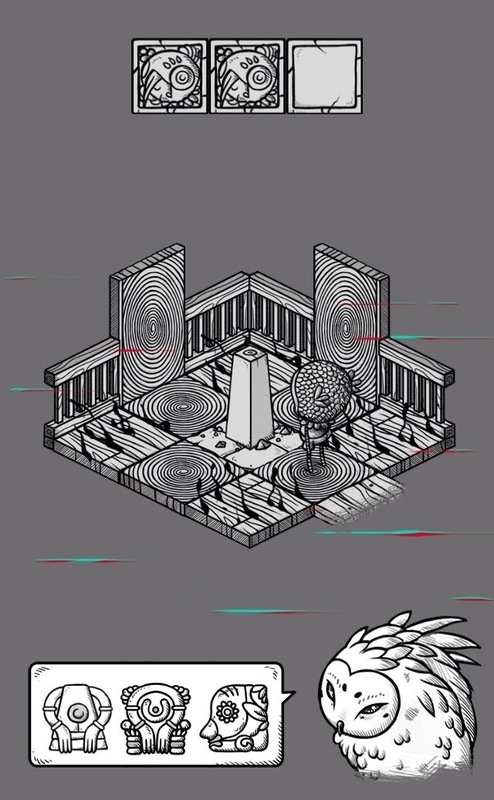 Throughout the game, you will need to change into other creatures. How and why are part of the puzzle. You tap or swipe in a direction to move your character from square to square. Everything works smoothly and each screen is small enough that running through worlds over and over again (as you will need to do) is fairly quick and painless. Granted, there are a couple of areas that send you in circles if you don’t memorize the pattern. But that’s part of the fun. It’s a bizarre Escher-like maze. Some players will love this while others will hate it. I have mixed feelings about it. Parts of the Rabbit world still managed to drive me a bit batty no matter how many times I’ve played through it. But finally finding that same elusive room was exciting every single time. The soundtrack is also worth mentioning. The developer has said that it’s a whopping 40 minutes long. Personally, I was too focused on the graphics and the puzzles to pay too much attention to the music. But it does noticeably change when you leave a world, and I found it did a perfect job capturing the mood of this strange world without being distracting. And that’s what good game music should do. My only gripe with the game is that perhaps it’s minimalistic to a fault. I like that you’re thrown into the game with no tutorial. But I kept looking for a way to pause the game (so it doesn’t just run in the background) or even find a menu with options. With no guidance, I experimented on my own with the little circle in the lower righthand corner. I tapped on it, thinking it would bring up a menu, but instead it deleted my game save without asking. I understand if they want to keep the game word-free, but a prompt with a graphic that fits with the game’s style would have been nice, asking me if I want to start over from scratch. For a game that rewards exploration, accidentally deleting my progress did not feel very rewarding. Even so, it’s not that big a deal, since you can get back to where you were fairly quickly. And once you know what happens when you press that circle, you can avoid it and just enjoy the game. 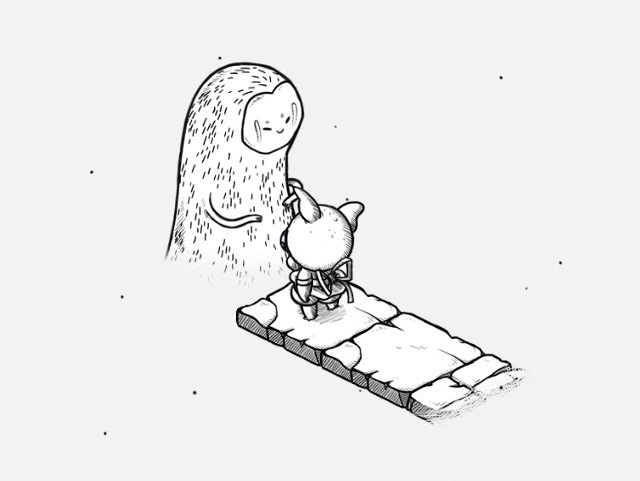 There are a lot of Easter eggs hidden throughout the world of Oquonie, which reward people for exploring every nook and cranny. Even when you think you finished the game, there’s more to do. In fact, I completed the game and I still don’t understand how to decipher the maps. So as far as I’m concerned, there are still some mysteries for me to solve! 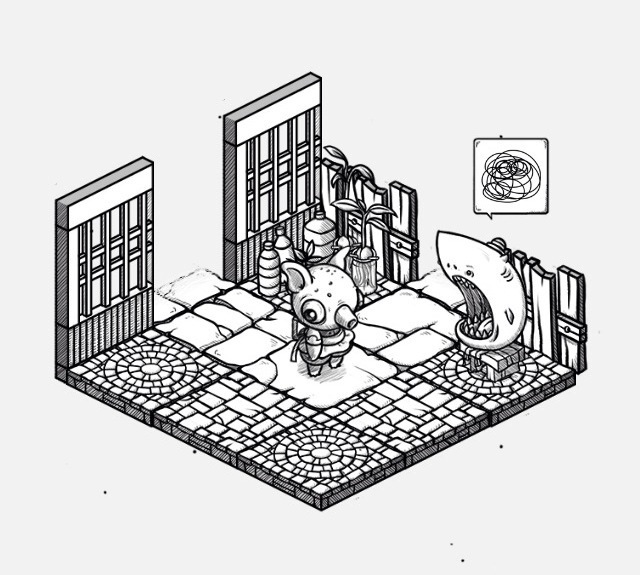 And if you need any help, check out our Oquonie Walkthrough and Strategy Guide.